Andy Murray converted on his seventh match point to beat Mackenzie McDonald in three sets and set up a second-round tie against fellow Brit Kyle Edmund at the Citi Open. McDonald, 23, broke two of Murray's opening three service games and wrapped up the first set 6-3 inside 40 minutes. But Murray drew things level, taking a crucial game nine in the second for a 5-4 lead and serving out the set. But McDonald saved five match points and converted his second break point to draw things level at 5-5. 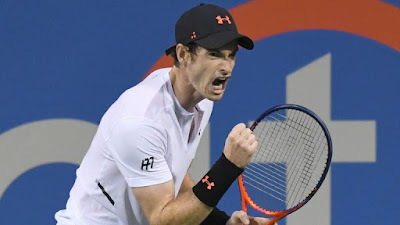 Murray broke back immediately for a 6-5 lead following a controversial call when McDonald's racket was adjudged to have crossed the plane of the net at 30-30. The former British No 1 then made no mistake in serving out the match. "It was a tough, tough match," Murray told the ATP Tour website. "It could have gone either way. Obviously, if you lose a match like that, it's a tough one. "When I lost to (Teymuraz) Gabashvili here (three years ago), I lost serving for the match, so I was thinking about that a little bit, too. It is just nice to get through. "I wasn't dictating many of the points. I wasn't hitting the ball that cleanly. I just fought and tried to make it tough for him. "Made a few little adjustments here and there. But mentally, it was a big one to get through."